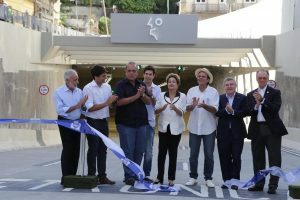 RIO DE JANEIRO, BRAZIL – The latest piece of infrastructure in the project to replace the Perimetral highway in Rio’s Centro and Port Zone, the Rio 450 tunnel has been inaugurated on Sunday March 1st, the city’s 450th birthday. With the tunnel, traffic in Centro changes again considerably. President Dilma Rousseff attended the inaguration of the tunnel with Mayor Paes and Governor Pezão, photo by Ricardo Cassiano/Prefeitura Rio. The 1,480 meters long tunnel connects Rua Primeiro de Março in Centro with Via Binário and the Gasômetro viaduct in the Port Zone. It normally operates in the direction from Centro to Port Zone, but reverses in the morning rush hour, in order to get people to their work place in Centro. The tunnel named ‘Rio 450’ in order of the city’s birthday was inaugurated on March 1st, the official birthday of Rio. The ceremony was attended by Brazil’s President Dilma Rousseff, who praised the city’s projects and the partnerships between federal, state and municipal levels. “I believe that the affirmation of the city of Rio de Janeiro is something very important for all of us. And we are proving here that a large change is possible, combining partnerships between public and private [sectors],” the President stated in her speech. With the opening of the new tunnel, which is the first one to be underground in Rio, several streets will change direction. The Sacadura Cabral street will now be reversed, as well as Centro main street Avenida Rio Branco, which now operates in direction of Rua President Vargas starting from Praça Maua, while the Rodrigues Alves street will be closed off to continue works for the VLT. 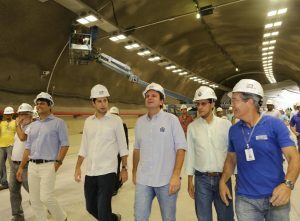 Mayor Eduardo Paes stepping through the new Rio 450 tunnel, photo by Ricardo Cassiano/Prefeitura Rio. The changes also affect 93 bus lines, as those that passed through Rua Acre, will transfer back to Avenida Rio Branco. Line 119 will not stop at Praça Maua anymore and lines 120, 121, 132, 154, 177, 178, 309, 314 and 316 that passed through Avenida Presidente Vargas will now follow Avenida Mal. Floriano, Rua Visconde de Inhaúma and then continue on Avenida Rio Branco. Brazilian newspaper O Dia published an overview graph with the most important changes to traffic here, while the Prefeitura has listed all changes to bus lines on this site. While the tunnel is an important piece of the entire project to replace the Perimetral highway, Secretary of Transport, Rafael Picciani, has acknowledged that in the short-term traffic will not necessarily improve. “The Via Binário will be overloaded with the change in direction of the Sacadura Cabral street, but the way out of Centro will improve a lot, because cars won’t pass through Rodrigues Alves street that has many traffic lights, but instead go through the tunnel,” Picciani explained. “The tunnel is a gift to the city and that will not solve all traffic problems, but already shows the first great mobility project of the new Port Zone. (…) We know of the sacrifice that mobility has been for a while and the tunnel is the start of the reward,” Rio Mayor Eduardo Paes told the press. During the month of March, the Rio 450 tunnel will be closed at night between midnight and 5AM for maintenance works.